In every bakery window in Santiago you can spot a Tarta de Santiago, a light almond cake that has the cross of St James dusted on top with icing sugar. You can buy boxes of these cakes to take home to your family and friends (I did!) but they tasted better right on the street in Santiago de Compostela. While I’ve been re-living my memories of the days on The Way, I wanted to taste this cake again, so I searched through some recipes and combined several to come up with this one. If you ever have a friend who is walking the Camino, you should make this cake to welcome them home from their journey! What a fun surprise that would be. Or make it for your own celebration of coming home from a pilgrimage! Or just make it because it’s yummy. Also, the filling can be made on its own without the crust in order to turn this recipe into a gluten free treat! PS. If you’re curious to learn more about the food on the Camino de Santiago, come back on Monday. I’ll be sharing all about it! Pulse flour, sugar and butter in the food processor until the mixture is in crumbs. Mix egg and water together and add to crumbs with food processor running until dough comes together. Dump out on a floured service and roll out to fit tart pan. 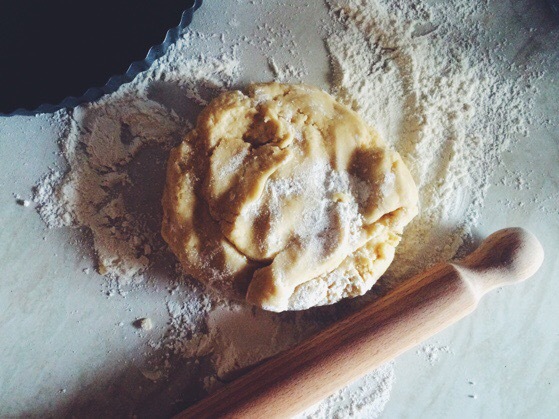 Place dough into tart pan and refrigerate for 20 minutes. Line with parchment, fill with pie weights (or beans) and bake at 400 degrees F for 20 minutes. Remove parchment and pie weights and bake for 5 more minutes. Set tart shell aside to cool and turn oven down to 350 degrees F.
Mix eggs and sugar for 5 minutes with a whisk until mixture is light and frothy. Fold in ground almonds, zest and almond extract. Carefully spoon filling into tart shell and spread evenly. Bake in the oven for 40-45 minutes or until the mixture has set in the middle and is light brown. Cool 15 minutes before lifting tart from the pan. Dust with powdered sugar and serve. In order to leave the imprint of the Santiago Cross on the tart, print and cut out the cross from a template. (Here’s one) Then place it on the cake when dusting with powdered sugar. This cake seems to actually improve with age, so you can make it the day before you want to serve it. Brilliant! Buttery, yummy good! I am so impressed!